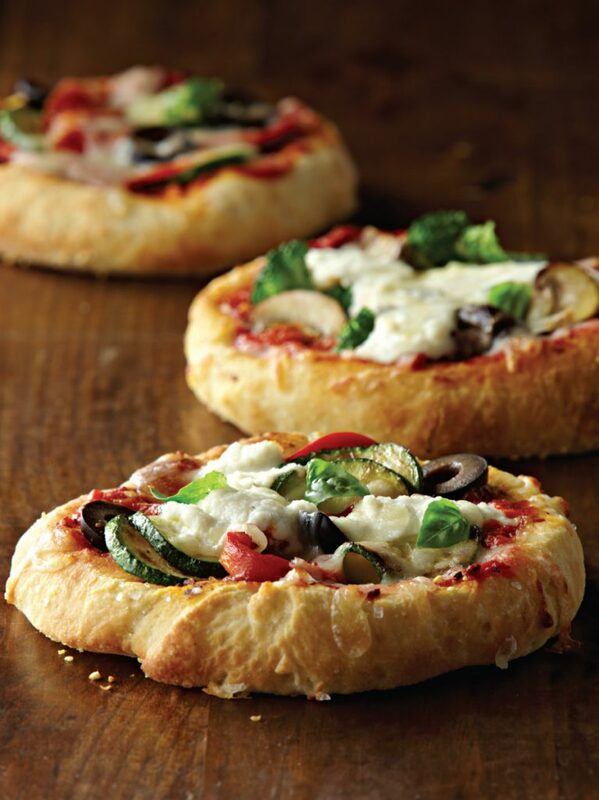 On a flat, floured surface, roll out pizza dough into eight, 5″ rounds. Place rounds on a greased and floured sheet tray and brush with egg wash or oil. Pre-Bake crusts for 10 minutes. Place cheeses, tomato sauce, and prepared toppings into separate bowls. Let each guest customize their pizza with the toppings of their choice. Bake pizzas on sheet tray for approx. 10 minutes, or until golden brown. Cut and sprinkle with fresh basil before serving. * Blanched Broccoli: Bring 2 quarts of water to boil in a large pot. Boil florets for 3 minutes. Immediately remove from heat, drain, and rinse under cold water until cool.